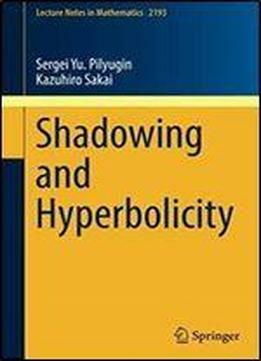 Focusing on the theory of shadowing of approximate trajectories (pseudotrajectories) of dynamical systems, this book surveys recent progress in establishing relations between shadowing and such basic notions from the classical theory of structural stability as hyperbolicity and transversality. Special attention is given to the study of "quantitative" shadowing properties, such as Lipschitz shadowing (it is shown that this property is equivalent to structural stability both for diffeomorphisms and smooth flows), and to the passage to robust shadowing (which is also equivalent to structural stability in the case of diffeomorphisms, while the situation becomes more complicated in the case of flows). Relations between the shadowing property of diffeomorphisms on their chain transitive sets and the hyperbolicity of such sets are also described. The book will allow young researchers in the field of dynamical systems to gain a better understanding of new ideas in the global qualitative theory. It will also be of interest to specialists in dynamical systems and their applications.